Soneros All Stars is not so much an orchestra as a concept: to bring together first-line Cuban musicians and create quality recordings of Cuban music genres. It was established as a company in 2001 by Swedish musician Jan "Yanesito" Miklas Bogdan, but it was not until the 2004 recording of the CD ¡Dime Nagüe! when Yanesito began his collaboration with the who's who of Cuban music that Soneros All Stars was truly born. Yanesito has been involved with music since the age of twelve when he began playing electric guitar in his hometown of Sandviken, Sweden. He was fortunate to end up in a circle of friends who were into jazz and blues, and he learned a lot during this period. In 1991 he entered Bolnäs Folkhögskola where he studied jazz guitar. He sites Mikael Hessler, one of his teachers, as a big inspiration, and in fact Mikael assisted in the production of La Timba Soy Yo . Yanesito's work as tresero was with a band that played Cuban, Brazilian and jazz standards, where he would alternate between electric guitar and tres depending on the song. In 1998 the group Stockholm Soneros was formed. They played mainly traditional Cuban music and some salsa and were a fixture in the Stockholm salsa scene. After a few years, however, people wanted to work on their own projects and the band split up. This was when Yanesito first began to think about the Soneros All Stars concept. He wanted to put together different projects in collaboration with leading Cuban musicians and go on tour. Yanesito's first project in Cuba resulted in the CD Mariano featuring María Cristina Azcuy. It was something of a jam session covering a number of traditional Cuban genres such as son, bolero and danzón. It isn't really part of the Soneros All Stars concept because Yanesito selected the musicians from acquaintances he had made in Havana jamming a local bars, not from the mayor groups, but it gave him his first taste of recording in Havana and a base from which to start. The first Soneros All Stars project was the CD ¡Dime Nagüe! an idea that came to life from a dinner conversation between Yanesito and Sinsonte when Orquesta Revé was visiting Stockholm. They wanted to do a CD that was in the style of Elio Revé Matos, i.e. less timba than under Elito and more changüí. Upon its release the CD received excellent reviews and was a favorite among many timberos and DJs around the world. But as this project went reached completion Yanesito was already thinking of what he wanted to do next. For his follow-up CD he wanted to collaborate with César "Pupy" Pedroso. This project faced several delays and was released much later than originally planned. But good things are worth waiting for and Yanesito hit another home run with La Timba Soy Yo . Looking at the first three CDs, the recordings follow the development of Yanesito's personal taste in Cuban music. He began with a fascination for traditional music such as son, boleros, danzón and changüí, the type of music that caught the attention of the world when a group of "old men in hats" exploded on the scene with the Buena Vista Social Club CD and movie. Next he moved to a modern changüí, very much a contemporary Cuban dance style. 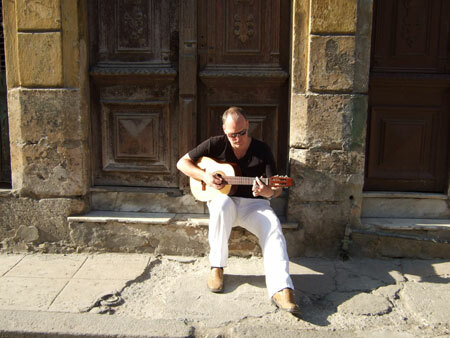 And most recently he chose to collaborate with Pupy Pedroso, one of the great Cuban musicians of modern times who has been on the leading edge of contemporary dance music since the 1960s playing modern changüí, songo, timba and eventually developing merensongo with percussion legend Changuito. From son, to changüí to songo/timba, so what's next for Soneros All Stars? Yanesito's next challenge is to realize the second part of his concept, he wants to begin touring now that he has enough material. We eagerly await the announcement of his first tour.